Increase compliance and generate additional revenue with eCommerce for Supplements. Recommend specific supplements -- by brand, name, quantity -- and your clients can easily order those supplements right from the MBODY360 App. Best off all you receive revenue from every purchase. We’re excited to introduce our latest feature that is sure to increase compliance and generate additional revenue — eCommerce for Supplements. 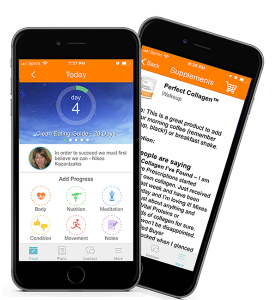 Now you can recommend specific supplements — by brand, name, quantity — and your clients can easily order those supplements right from the MBODY360 App. And best off all, you’ll earn revenue on every purchase. We’ve streamlined the whole process for you and your clients from recommending to purchasing to tracking to viewing results. With one platform and one login, ensure your clients are using the right supplements, at the right time and getting the right health outcomes. Add supplements to one of our “Done-for-You” plans, providing your clients with the complete information and convenience they need to successfully improve their health. Or talk to us about adding your own custom plans to MBODY360. Set ups is quick and easy — just two steps to increased compliance, better health outcome and additional revenue. We’ve partnered with PurePrescriptions.com, PureRxO and PureCapsPro giving you the option of joining a simple affiliate program or integrating with your own online dispensary. All three carry top-quality, professional brands and provide great customer care. Really That’s it! Your App is Now eCommerce Enabled! Clients will see a shopping cart button on the top of their supplement list and supplement details screens. It’s one click to the shopping cart on your store. Clients can easily purchase the right supplements and track compliance. They also receive reminders to take their supplements. Learn more or login to the Practitioner Portal to get started today!